New York may not be my city but it’s a dang good one. 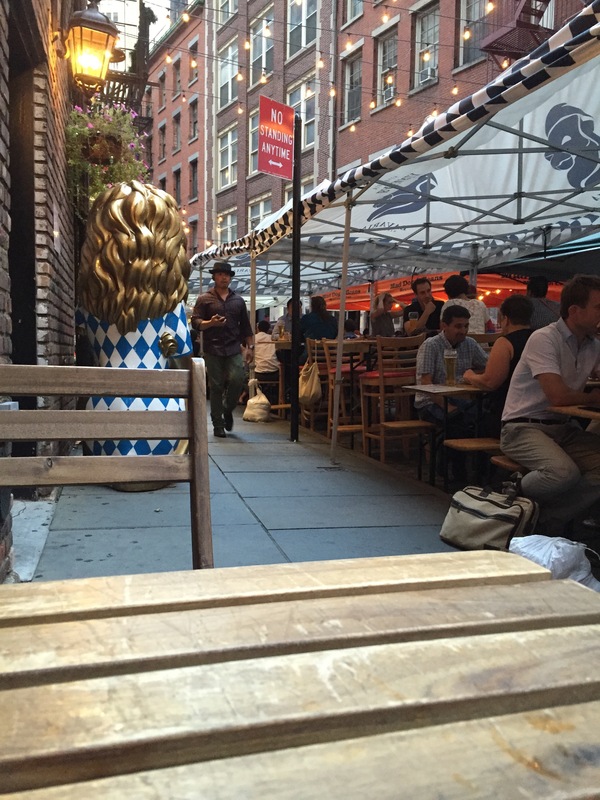 I visited Kat and Wes in NYC last weekend with Katie in a grand celebration of all things summer and musicals. Despite spending the days working, our visit had a decidedly festive air. We ate empanadas in Times Square, toasted to the weekend in a noisy beer garden with fellow New Yorker, Kate, and watched the moon rise over the glittering lights of Broadway. 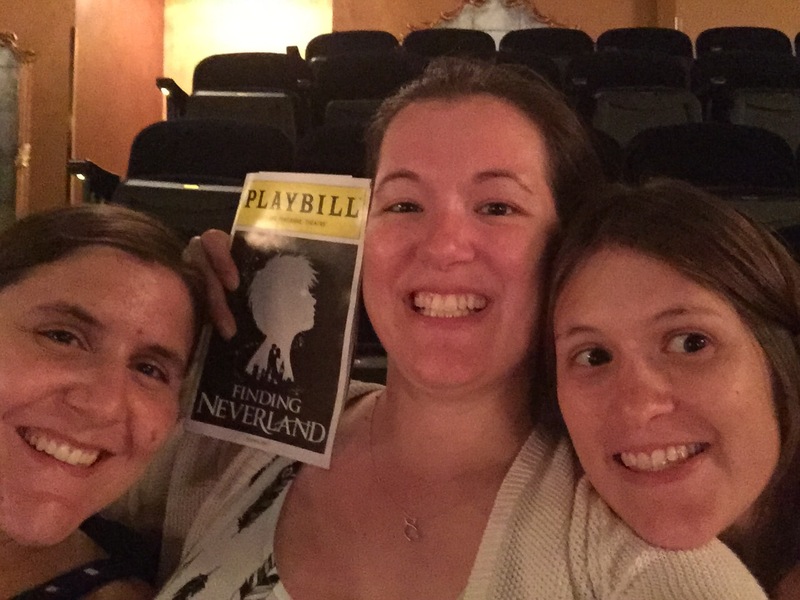 Just before the Tonys, we bought tickets to two new musicals: Finding Neverland and Somethjng Rotten. If they won big, we didn’t want to miss seeing the OBC (Original Broadway Cast). And even though they didn’t, we couldn’t wait to see what they had in store. First was Finding Neverland: the story of the family and man behind Peter Pan. I saw it twice when it was at the ART in Boston starring Jeremy Jordan and it brought me to tears both times with great stagecraft, moving songs, and adorable plot. The magic held on Broadway, though the seats were much further away. 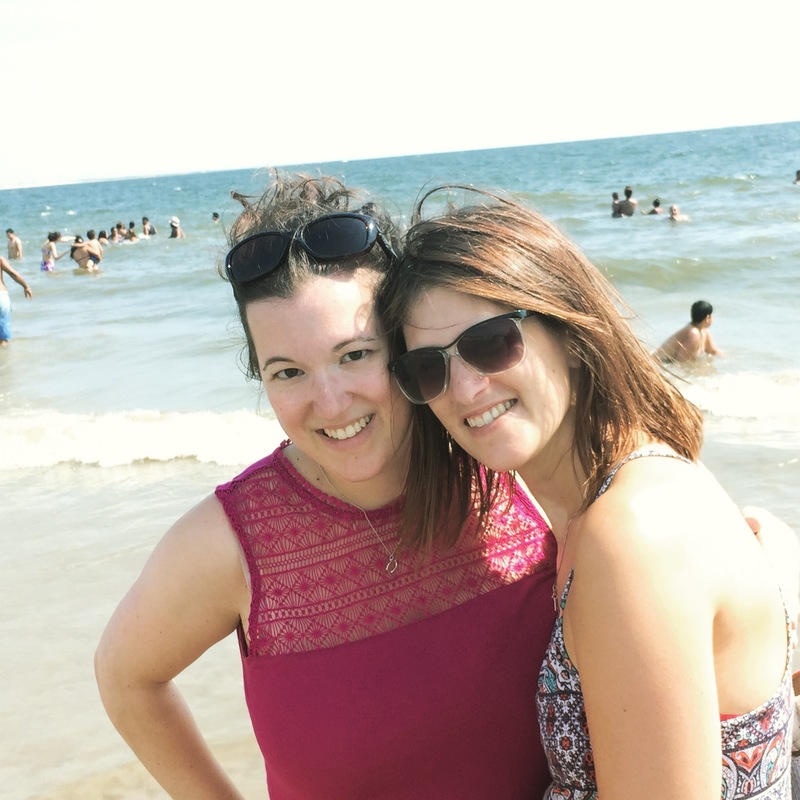 Saturday was spent at Coney Island, drinking lemonade, riding thrill rides, and sticking our feet in the water for one last dip of summer. 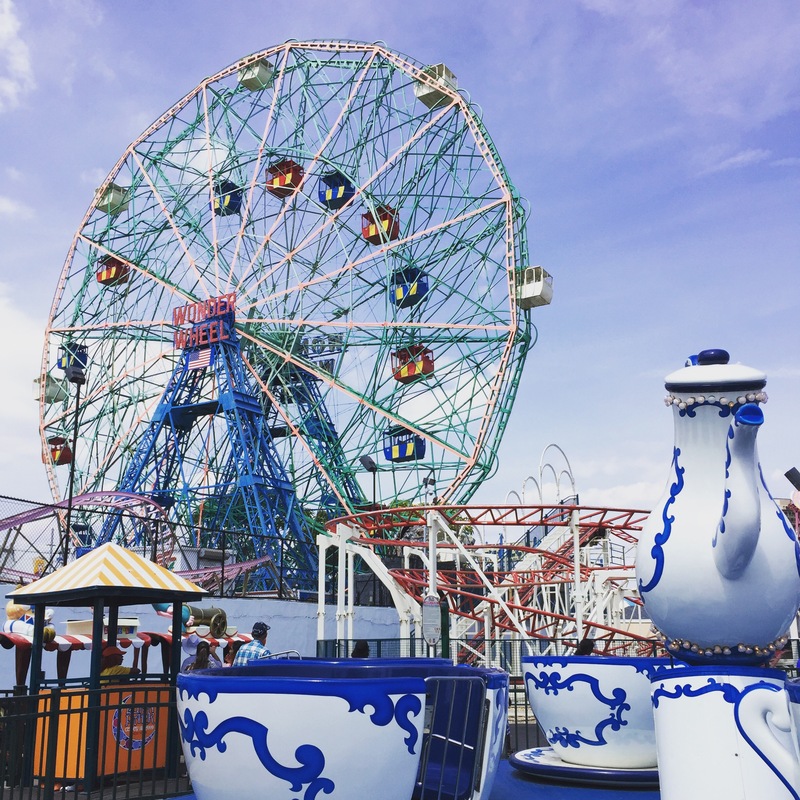 Coney is one of the most colorful beaches I know, and so fun to look at from the pier, with its bright coasters rising almost from the sand. In the evening, we saw Something Rotten – the tale of brother playwrights trying to break out of Shakespeare’s shadow. It was basically made for musical theater lovers and 17 year old boys, with its crude humor and send up to every hit show in the last 80 years. 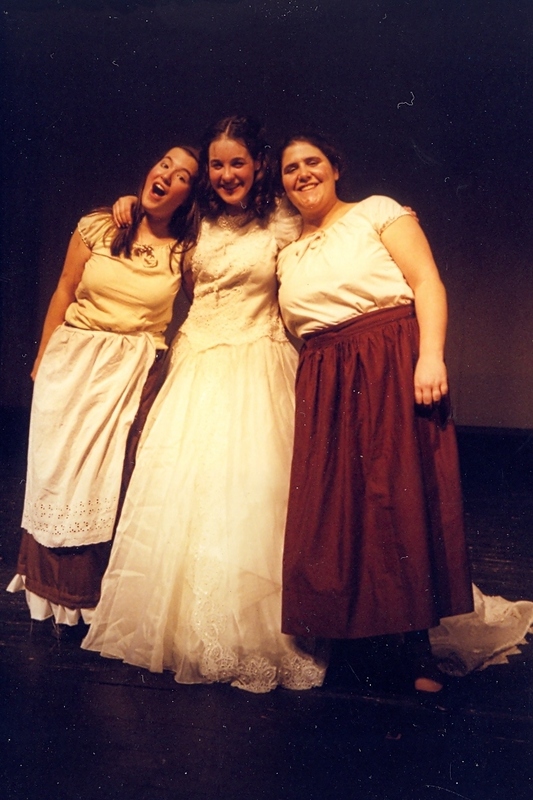 “A musical” was legitimately a show stopper – I spent the four minutes clapping trying to figure out if anything I could do or shout would get them to give an encore presentation. Our greatest adventure came as we were leaving, and took a shortcut down a staircase that had just been closed off – only to find that the entrance back into the main theater had also been closed off and now we were en route to backstage, along with friends and family of the cast. “Is that Josh Groban or someone who looks like him?” Kat asked. Yep, it was him. We followed him out the official exit into the night, past the waiting fans who didn’t give him or us a second glance. I headed home with new songs in my head, NY bagels in my stomach, and a light sunburn on my back. Viva summer adventures! What’s your favorite thing to do when visiting NYC? Have you heard the news(ies)? It’s a fine life – even finer now that the 1992 classic musical Newsies is being made into a Broadway musical. The film stars Christian Bale as a newspaper delivery boy fighting back against an increase in distribution rates. Good times, especially as he belts out off-key showstoppers like “Santa Fe.” I especially love the big dance scene in “Seize the Day,” which was my Music Monday not too long ago. Check out a clip from the production below, and join me in asking – what took you so long, Disney? What do you think? Will you go see it (with me!) when it comes to Broadway? PS: On a related note, can we get Hollywood to stop re-making awesome musical movies and move toward a version of Fiddler on the Roof that I can watch in one sitting? Thanks. Yes, it’s Monday. Yes, we all have headaches and hangovers and sunburns. Yes, we’re far from another weekend. And yet, let’s try to seize the day, Newsies style. Arise and seize the day… it’ll make Friday come a whole lot faster!